Person of Interest, 4-5:15pm, University B — Look you all know I have MANY feelings about Person of Interest so I am thrilled at the chance to go on about the show with some of my favorite people for over an hour (it won’t be long enough but I’ll try to keep myself reined in). 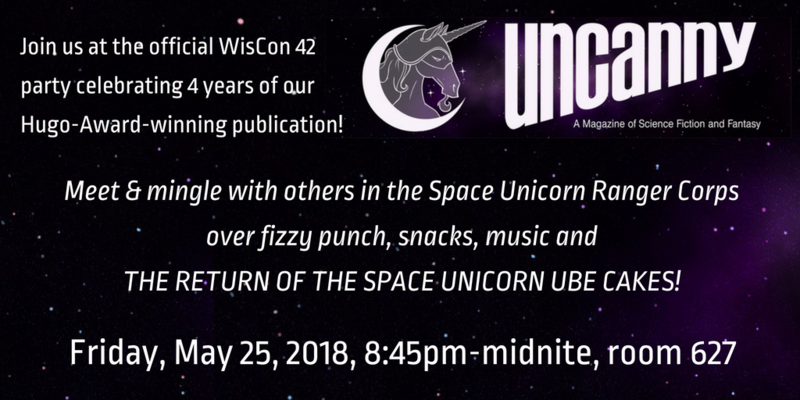 Uncanny Magazine presents A Space Unicorn Sparkle Party featuring The Return of the Space Unicorn Ube Cakes! 8:45pm-12am, Room 627 — fizzy punch, snacks (I’m making a pit stop at Seafood City so expect some of my favorite Filipino treats to be on the table), music, and TWO of Jennivee’s Bakery’s famous ube cakes! Can’t wait to see you, Space Unicorns! Let’s Go Steal a Panel (Again), 4-5:15pm, Assembly — We’re back to geek out more over Leverage! Because obviously last year’s panel wasn’t enough (hint: there’s never too much talking about our favorite found family of thieves and grifters). All the info you need about WisCon can be found on their site. Also if you find you have extra time on your hands, please consider volunteering at the con, especially with the Safety team. Volunteers are what make WisCon run and the concom works so incredibly hard to make WisCon such a wonderful weekend. The more hands they have to help out, the better. This entry was posted in Cons, Panel and tagged panels, schedule, WisCon by Michi Trota. Bookmark the permalink.